Sure it’s free. But is it easy? 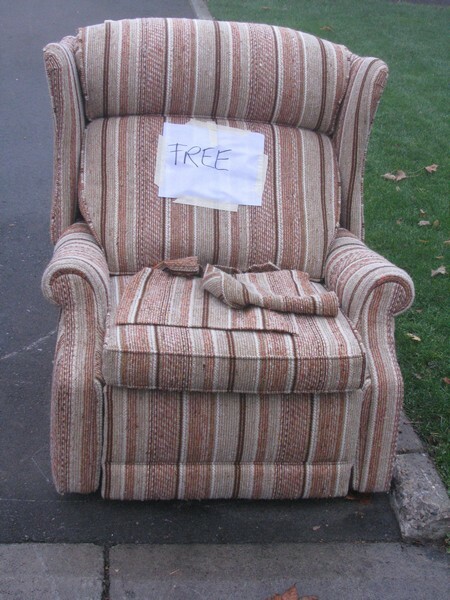 Nothing lonlier than a comfy chair at the curb … hopefully onto a wonderful new life. Is there a chair rescue association out there? So simple, a great pic! Back in my younger days I got some of my favourite things this way. many items in our basement came from a sign like that! A discerning eye can do quite well! Is it from watching too many cartoons as a kid that I expect this chair to just lift itself up and wander down the street in search of a new owner? :) I do wonder, when I see older furniture, what things it’s seen and what stories it could tell. Carin, you have such a great eye for the extraordinary in the ordinary. Great WW. p.s. How many cartoons did you watch?? ?